Having already run six marathons, Marjan Faraidooni will raise funds for the Lurie Center for Autism by running the 2019 Boston Marathon. 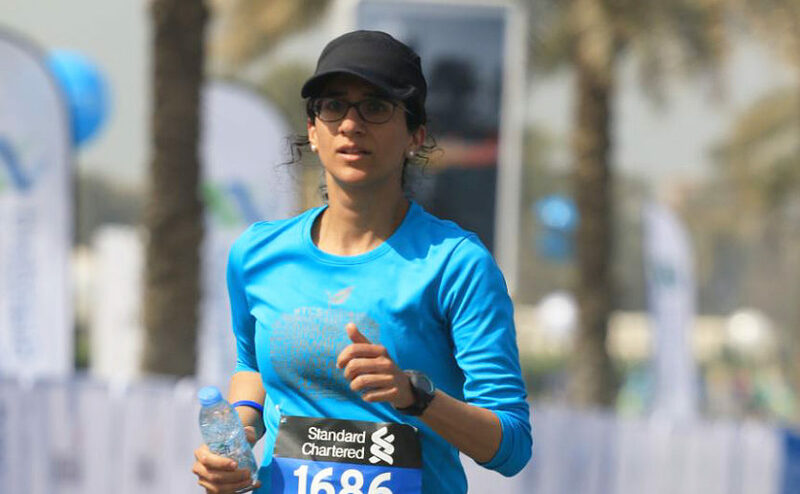 The flat streets and predictably hot climate of Dubai don’t align with what runners experience in the Boston Marathon, but that doesn’t deter Marjan Faraidooni from training in her home city, Dubai, 7,800 miles away from Boston. A public health graduate of Boston University (BU), Marjan knows the terrain of the marathon route and understands the unpredictability of New England weather. But what really helps her focus on training for the famously tough race is that she is running this year’s marathon with a mission — to raise awareness for autism and support for Mass General’s Lurie Center for Autism. Marjan, 40, is running on behalf of Hamza Dahlan, the seven-year-old son of her friend, Malik Dahlan, a Harvard University graduate she met while attending BU two decades ago. Marjan saw the life-altering impact that a child with autism spectrum disorder (ASD) has on a family, and the challenges that parents, like Malik and his wife, Sarah, face in securing appropriate resources. She also felt it was important for every “inclusive society” to understand the special qualities of individuals like Hamza and to support them and their families as they work to ensure that they have access to opportunities and support in their communities. Marjan decided to run for Mass General’s Lurie Center knowing how important it is to Malik, Sarah and Hamza and the nearly 3,000 other families who rely on their expert care. Malik and Sarah feel fortunate to have Marjan as a champion for autism awareness and Hamza, and to have the Lurie Center as their family’s guardian angel. Read about one family’s efforts to extend the Lurie Center for Autism’s global reach. Indeed, the online news service Arabian Business last year named Marjan as one of the “50 most influential women in the Arab World.” After earning a bachelor’s degree in physiology and a master’s in public health at Boston University, she returned home to the United Arab Emirates in 2001 to work as an instructor at a college and then held various strategy positions in healthcare and finance. Five years ago, Marjan landed a key role in her country’s hosting of a world expo. As senior vice president of legacy development for Expo 2020 Dubai, she helps ensure that investments in infrastructure and redevelopment of the Expo site create lasting economic and social benefits for the city. Having already run six marathons, including New York in 2014 and London in 2015, Marjan didn’t hesitate when Malik and Sarah offered her the opportunity to raise funds for the Lurie Center through a charity entry to the Boston Marathon. The Lurie Center for Autism relies on philanthropy to provide multidisciplinary care, an expensive endeavor for which insurers cover less than 50 percent of the costs. The Center’s evaluation and treatment plans combine the perspectives of physicians, psychologists and nurses, along with those of educational and behavioral consultants, speech-language pathologists and physical and occupational therapists. Hamza went from not responding to his name to now speaking, reading, writing and attending a mainstream school. After years of research, Sarah credits this multidisciplinary approach with properly diagnosing children and then putting into action comprehensive treatment and intervention. Hamza went from not responding to his name to now speaking, reading, writing and attending a mainstream school. The center is about “halfway” to opening, Sarah says, and has benefited from occasional visits from Mass General researcher Nicole Zurcher Wimmer, PhD, who is a “Hamza Scholar” thanks to the generous support of the family. Please consider supporting 2019 Boston Marathon runner Marjan Faraidooni. For more information about how you can donate to the Lurie Center for Autism, please contact us.